List of compatible launch monitors? Can someone point me to a list of compatible launch monitors to use with Perfect Golf? GC2, Flightscope Xi+ and above, Trackman 3e and above, used SkyTrak with existing Perfect Golf subscription (can renew but not get it with new unit). Note Flightscope can't handle putting and Trackman not good on short putts from what people say. If you want to enjoy it, have accurate ball data, not deal with lag or any fuss, get a GC2. I'm not a rep or affiliated in any way. It comes down to the technology in a small space. The camera based monitor is going to provide the most accurate information off a short flight. DIY setup like Protee (multiple cameras positioned about your sim room and a special hitting mat) gets good reviews for the price but it's not for JNPG. GC2 or GC2/HMT plus JNPG is what most will recommend. And of course OnlinegolfTour.net membership. 420 members now with great tournaments, scrambles, CTP, long drives, Combines, Top Golf, and many more. GC2 is probably the way I'll look into. Is the HMT necessary? The GCQuad is not supported? How come? HMT is not necessary. Quad's BT has not been enabled so it can not be used. I bought an old GC2 with HMT. Make sure it has Bluetooth. The HMT is not necessary for JNPG but if you like numbers (as I do) its a brilliant bit of kit. The OGT range is brilliant for collecting the data but if you have an old iPad the Foresight software is free on iPad or iPhone but £2k to put on a pc. Quite bizarre. I bought an old iPad for £40 on eBay and it’s brilliant for data collection. The GC2 works superbly with PG and I rarely have any issues. Once BT is enabled on Quad, it should be good to go? Is the software needed on a PC to use PG as a simulator? Only JNPG. Unbelievable value at £30 with hundreds of courses free to download. Just a good Bluetooth connection required. I tried with a laptop that had an inbuilt BT and it was rubbish but on advice on the forum I bought a BT receiver for a few pounds on eBay and it worked perfectly with my desktop. It’s quite specific on connecting the GC2 and PG. I find booting them up at the same time that I don’t have any issues. All I need is GC2 $5400, JNPG from Steam store for $34.99, and I can have a full fledged simulator? Is FSX software Foresight's range software with some games? FSX does come with a few courses but they are nothing like the quality of PG. The only advantage is that you can play and see data on screen but there are ways to use OGT Range to get the same thing. It takes a bit of setting up but can be done at a cost of $20 OGT donation compared to 100x that for FSX. I have an iPad on a stand in front of me rather than projected onto the screen. 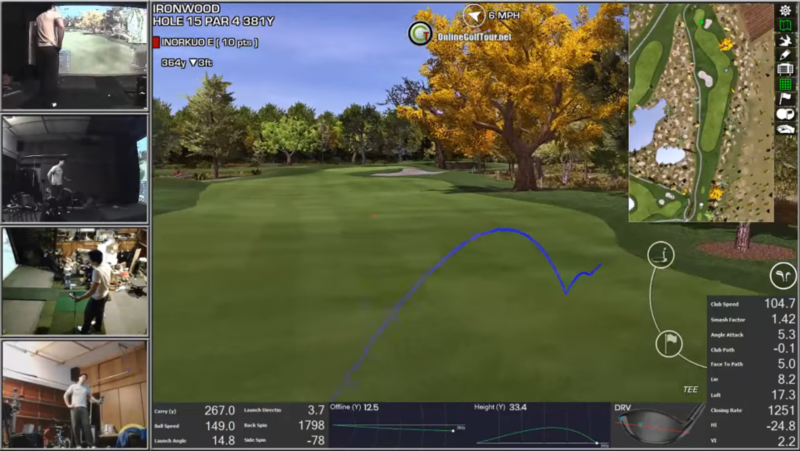 It’s clearer and easier to switch between the ball and club data if using the HMT. Connect to OGT discord chat and look at #classified sections. Used GC2s can be found for 4-4500. Foresight also sells Certified Refurbished units that come with warranties and I've been told pretty much replace all parts. The HMT will give you club data (useful for swing analysis). All the ball data comes from the GC2 main unit which is the only data used/needed for flight calculations for all the sims. You can get an App from Foresight which is like 50 bucks and will give you the ball data that you get from the expensive FSX software. I own FSX and spent about 2k on it. I only use it to hit balls because I like it a little better than JNPG range because it charts all the shots for analysis. The app does this as well. Haven't played a course on it in 3 years. I just saved you $1950. You're welcome. NB - the reps will try and tell you that you have to purchase the FSX. Tell them that you aren't into simulators and just use it to hit balls at the range or against a net and just need the app. You have to buy the simulator software from the PP/steam store for $250 annually. And if you're lucky you can find a GC2 for around 4k used, pick up a spare flash for $150 and you're all set. HMT is for analyzing swing, GC2 for analyzing ball. Not only is HMT not necessary, JNPG doesn't use any of its data. Third party programs can however display and visualize its data on top of JNPG. GCQuad is not supported to force people to buy Foresight's proprietary software - FSX 2018 @ $3k, and courses at $750-$1000 each. This 3rd party site is called OGT. Using OGT Interface plus Schogolf app, you'll get data screens like in the image below. Note: Membership is required to access these features along with many more cool stuff. That set up looks brilliant. I’ve used the OGT interface on the practice ground but couldn’t figure out how to show the data while playing a game. Is there a tutorial for this? Yeah, there are guides on OGT's Discord channel.